A lineup of Martin by HARMAN lighting fixtures, including the new Atomic 3000 LED strobe, are illuminating the way for Disturbed’s world tour. 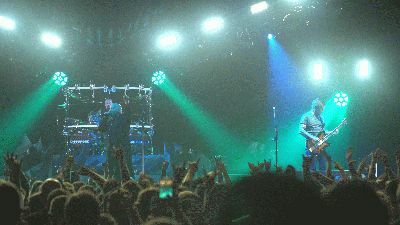 In support of the release of their new album, Immortalized, the members wanted to deliver an in-your-face, larger-than-life show. Lighting designer Matt Mills, who worked with Disturbed on the band’s last tour in 2011, deployed an array of Martin MAC Quantum Washes, MAC Viper Profiles and Atomic 3000 LEDs in a light show aimed at mesmerizing huge arena crowds. Mills’ previous work includes tours with Nelly Furtado, Motley Crüe, 3 Doors Down and Linkin Park. The Disturbed tour, which began last month, will cover more than 60 cities in the U.S., Canada and Europe. The full Martin rig includes 24 MAC Quantum Washes, 30 MAC Viper Profiles and 40 Atomic 3000 LEDs. Mills was excited to finally get his hands on the new Atomic 3000 LEDs and was surprised by their output, despite his years of experience as a veteran lighting director. The Atomic 3000 LED is not only a strobe, but also a powerful creative tool that incorporates backlight illumination with RGB-controlled LEDs pointing into the reflector. These fixtures deliver stunning eye candy that looks similar to the MAC Aura and the MAC Quantum Wash. Internal FX macros and simplified reuse of the original Atomic Colors Scroller complete the full-feature package and empower the Atomic 3000 LED to become the ultimate creative lighting tool. Mills is especially fond of the aura backlight component incorporated into the Atomic 3000 LEDs. He said the band uses a lot of electronic effects for their intros and guitar solos, and he uses the built-in macros in the aura to complement those sounds. For a fast, heavy-hitting band like Disturbed, Mills wants to blow audiences away with huge looks while also creating quick changes and accents that keep pace with the band. Mills uses the MAC Quantum Washes to light the band, and particularly appreciates the versatility of the MAC Viper Profiles. Mills also wanted to make sure the audience would get a variety of lighting looks during the shows. He said that the band usually establishes a defined setlist after some time on tour, but there is always room for experimentation. Mills built six trusses, each with four MAC Quantum Washes, four MAC Viper Profiles and four Atomic 3000 LEDs. In addition, four ladders are suspended on stage, each equipped with two Atomic 3000 LEDs. Mills has been using Martin products for a decade and has a great working relationship with his vendor, who ensures the fixtures he uses stay in top working order.